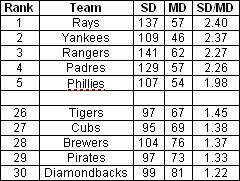 Earlier this season, I brought up my dislike for the Saves statistic. Then, Tom Tango got the ball rolling (here and here) on creating a better way of measuring relief appearance success and, within a couple of days, the statistics Meltdowns and Shutdowns were available here at Fangraphs. Shutdowns were supposed to mirror the total number of holds and saves in a season. 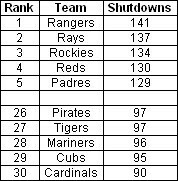 As of yesterday, a total of 3403 number of shutdowns have occurred so far this season compared to a total of 3142 saves and holds. With only about 8% more shutdowns being recorded compared to saves and holds, the logic behind the values seem to be holding up fairly decent. It seems the cream rises to the top as the top five teams have made the playoffs or are still in contention, while the bottom five teams are not going to make the postseason. All the teams with the most meltdowns won’t make the playoffs, except maybe Colorado. 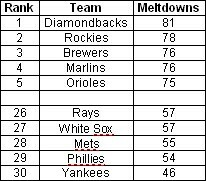 Three of the five teams with the least number of meltdowns will make the playoffs with the Mets and While Sox being the exceptions. Having a capable bullpen that keeps its team in games (compiling shutdowns) and doesn’t blowup (meltdowns) isn’t all that a team needs in order to make the playoffs, but all the teams making the playoffs have addressed it nicely during this season. We hoped you liked reading Shutdowns, Meltdowns and Making the Playoffs by Jeff Zimmerman! One factor in this, which in some cases may have nothing to do with the quality of the bullpen, is whether or not the bullpen inherits many high-leverage situations. I am a Mariners fan, and if you look at the shutdown/meltdown statistics, there are only two pitchers (Aardsma and League) who have much of either. But I think that’s because the Mariners are so often out of the game by the time the bullpen comes in. Good teams, by virtue of their offense and starting pitching, will keep more games close, and thus hand on higher leverage situations to their bullpens, and will thus accumulate more, not because of the bullpen’s quality, but just because of having more opportunities. For the reasons you stated, is the reason I like the ratio used. With the Mariners, they had shutdowns = 96,meltdowns = 63 and a ratio of 1.52. They are just below league average, but number of meltdowns is what brings there ratio down. Yes, I see. I like the concept. Good work! I really like the concept of looking at the SD/MD ratio. Any way that could be added to the leaderboards?